Continuing a theme of walking a mile in another man’s shoes, I walked six with a fascinating subject who challenged the heck out of me. We met at his home, perched high atop the hill on the edge of Lincoln Park. Blake is an explorer, wanderer, entrepreneur, musician, seeker, and a new dad. And man oh man, the dude walks. Totally addicted. Blake regularly makes the back and forth trek to Spirit Mountain, pictured far in the distance. He walks the opposite direction to his downtown office nearly every day in all sorts of weather. A thinker—delighting in uncovering meaning and beauty—he chews on philosophical matters whilst he goes. The philosopher casts the appearance of a redneck, but as I’ve discovered with so many others, there’s a whole lot more lurking beneath the surface. All this time spent in reflective thought and observation, adds a rare depth and weightiness to the lyrics he contributes to his band’s music. Glen’s Neighbor—yup, that’s their name—is probably the best local band you’ve never heard of. Their latest album, Your Unknown, releases this Friday, the 21st. I received an advance copy, and loved it. I’m blown away that the group was previously unknown to me. After listening to their debut album on Spotify, which is good, this sophomore release is a real graduation. Blake in his music room, moments before we walked to his day job. Though a busy entrepreneur, Blake is noticeably relaxed. His habit of walking six miles roundtrip to work and back every day, year-round, is key. The daily trek takes him straight through the gritty Lincoln Park neighborhood. I found the scenery and architecture to be stunning, far more noticeable on foot. We walked beneath hundreds of drivers on this overpass, who in their haste, miss out on untold treasures every single day. Blake has been through things that could have caused him drown in a sea of self-pity. Instead, they made him stronger. 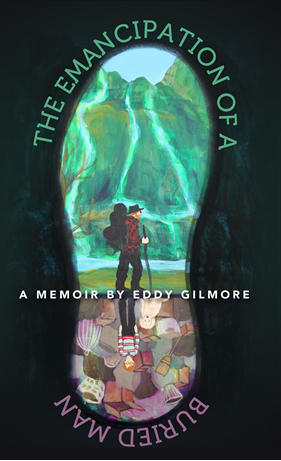 Rather than becoming stuck, he continuously forges a path forward, one foot at a time, while allowing the big questions to tumble around in his mind. As we walked, his reverence for uncovering depth and mystery in unlikely places became infectious. Some hidden mystery lies at the top of these steps along the road. Stuff like this exists all along the way. Blake landed a good-paying job right out of college. Rather than blow it all, he invested in rental properties with a friend. They lived in various houses with roommates throughout their twenties, fixed them up as rental properties, gradually building equity. They went on to establish a property management company, Shiprock Management, that now has 25 employees. Living simply enabled him to build a business AND pursue the things that bring him joy and fulfillment. He lived in a modest dwelling tucked behind this home, down the narrow path, just two years ago. I met the successful entrepreneur the day before his 39th birthday. He lived on the other side of this narrow path just two years ago. Shiprock continues to manage the property. We connected over the knowledge that we had both lived in the same dumpy college house while attending the university. He became friends with Dave Simonett, of Trampled by Turtles and Dead Man Winter fame, around this time. In what must have been a move of desperation, Dave carved out a room for himself in the disgusting, moldy basement that flooded on occasion. It was in a dark corner of the damp basement, an area I had avoided. The walls were covered with blue carpet from the seventies, and we called it the “padded room.” Disgusting. After Shippee began acquiring properties, he’d hire Dave for miscellaneous carpentry projects on occasion. Trampled By Turtles performed some of their earliest concerts in the basements of these rundown dwellings. One stands out to him in particular. Dave had built a stage in the basement of a large Victorian home Blake still owns in Superior. About a hundred people were gathered for a show that was absolutely rockin’. Shippee hilariously recounts the story of a toilet being flushed non-stop directly above the venue, a leaky sewer pipe, and an emergency patch-job involving duct tape and all the towels he could muster. The winding road on Blake’s daily walk provides ample opportunity for reflection. Simonett produced Your Unknown for Glen’s Neighbor. The album was created over a period of five days at world-renown Pachyderm Studios in Cannon Falls, where Nirvana recorded In Utero. This release surpasses their first record by leaps and bounds— lyrically, instrumentally, and in overall quality. It’s obvious that they’ve grown artistically and in technical proficiency since releasing Behind The Door in 2015. It’s as if the gloves have come off. Blake and company have really come into their stride. I can pretty much guarantee that Blake will be horrified by all the attention I’ve given him here. He’s a super humble guy, as is the rest of the band. There are no head-cases, and they work collaboratively. Their sound is difficult to pigeonhole. Complex, yet accessible. As a starting point, I’ll offer up bluegrass/rock/honky-tonk rockabilly/Americana. Superb artistry and musicianship are on full display throughout Your Unknown. These guys aren’t just some bar band, although I have to say they’d make a fine one. They’re fantastic live, and I’m pretty stoked to have taken them in as an audience of one! In order to observe one of their weekly rehearsals, I descended into a mysterious 19th century basement on Superior Street. Somewhat nomadic, this was to be the group’s last practice in this space. It helps that Blake is a property manager by trade. His connections all over town have helped the group line up practice space for years. Pardon the amateur recording, but I couldn’t resist sharing this experience with you. I was immediately greeted by a wall of sound: seven guys absolutely owning their space. The dobro adds that sort of honky-tonk sound in spots, and a smooth-as-butter electric guitar pairs up perfectly with the banjo—utterly unique. Then there’s Blake on vocals and acoustic guitar, a strong bass, and keyboards—the player of which has to be the coolest substitute band teacher the Duluth School District has ever seen, and a full-on drum kit seamlessly keeping a beat. Nobody in the band, and none of the instruments overpower the others, including the vocals. They fit in with each other like puzzle pieces through a synergy-creating alchemy. The combined effect is greater than the sum of the parts. Their connection and timing are impeccable. The guys are real characters. Watching them play together with sheer pleasure on their faces is to experience audio and visual refreshment. They are doing this out of a pure love for the music, and no other reason. The results are fantastic. One can go as shallow or as deep as they want with this music. You could put them on and just rock out to the jams, dancing in your writing studio while swallowing fistfuls of red Swedish Fish, just getting lost in the upbeat tempo of some of the tracks (not that I did that or anything). Or you can mine the lyrics to discover their surprising depth of philosophical thought, and learn things like Samuel Clemens (Mark Twain) “coming in and going out on Halley’s Comet.” There’s a lot going on between the ears when you dive into the lyrics, so I hope they’ll include a lyric sheet in the album notes. It’s well worth following along while trying to decipher their meaning. They mix up the tempo, with some of the songs being more broody and poignant, such as “Search,” which Blake says is about, “My father’s struggle to live above his means, keep up with the Joneses, and then losing it all and committing suicide.” Hearing the band play alongside Blake and harmonizing with him, gives the sense that they are all supporting him as he processes a grievous loss, one he’ll never fully understand, but remains cathartic to reflect upon. The last song, Dancing Man, has Lydia Liza paired with Blake. Absolutely beautiful. Poetry set to gorgeous harmony. A lovely finish to a breakout album. Most of these guys have been playing together for over 15 years. They’re close friends. This comes through in their impeccable timing, symbiotic seamlessness, synergy, ability to collaborate, and shared priorities. I can identify about a dozen instruments in their music, and they come together almost symphonically as if under the direction of a maestro. It’s a big sound, but rather than coming straight at you as an assault on the senses, they mesh together warmly in a way that a musician might describe as a round sound (lacking the hard edges of say, hard rock). Collectively, they enfold the listener into the world of their music. After the guys embraced this new direction and began crafting their own music, they decided a new name was in order. Blake really didn’t care what they were called. The banjo player suggested Glen’s Neighbor off-the-cuff, because they rehearsed in a space rather close to Glensheen Mansion at the time. OK, housekeeping: that band name? It’s terrible. Who is Glen? Who is his neighbor? … Why isn’t the band named “Steve,” or whatever the name of Glen’s neighbor actually is? What if the Rolling Stones or Metallica had been called “Glen’s Neighbor”? Would they have ever made it? Has there ever been a band that had a possessive noun in their name that was successful beyond a song or two? These, fair reader, are the questions that should keep you awake at night. Even after enduring all sorts of criticism and unsolicited advice over their name, they’ve stuck with it because they put 100% of their energy into creating great music. The goal isn’t to “make it big” or get famous. Without enduring a relentless touring schedule, it’s nearly impossible for a band of this size to make a living from their music. They’ve made a conscious choice right from the get-go to just have fun. Rather than toss and turn over anxieties about achieving fame and fortune, they can sleep at night. In their own beds. Their relaxed approach definitely comes through in the music. Egos are checked at the door. The guys enjoy their weekly rehearsal together, putting out an album when they are able, and doing maybe two to three gigs each year. So, if you’re in or around Duluth you should treat yourself to one of their rare shows. They opened for Dave Simonett/Dead Man Winter for a sold-out show back in February, and absolutely killed it. You can catch them on May 6th as part of the Homegrown Music Festival at the HORRIFIC time of 11 pm. The sacrifice of sleep will be worth it, however, because it’ll probably be your last opportunity to see them in Duluth this year. I can absolutely testify to this sentiment. It’s pretty much the reason I was unable to complete my upcoming book this past winter. I just didn’t have the freedom or brain space set aside to create. My conversation with Blake has proven absolutely pivotal as I consider my “career” as a writer. I’ve decided to take a page from his playbook, and write for fun, producing a book here and there when I can. For money, I’m taking the super practical route of starting an urban farm, Tiny Farm Duluth. On occasion, as this experience demonstrates, I’ll transform tinyfarm into a verb or perhaps even a state of being. This is a mindset whereby we delight in an abundant harvest of another type of crop altogether: the talents of our neighbors. There are outstanding gifts and treasures to enjoy right here in this community. This is something you should take part in as well, wherever you are. One of the great things about this band is that everyone is super accessible, lacking the ego that seems all-pervasive in the entertainment industry. And that’s another thing they aren’t: industrial. They aren’t pumping out bland music for the masses like sausages in some factory. Rather than being a mile wide and an inch deep, this is the sort of hand-crafted work that will be deeply loved by a few instead of merely “liked” by the masses. This music was formed in an actual place, by real people encountering real life experiences like the rest of us, in a real community. It’s connected to time, space, and community. It might seem odd to say that, but this has become increasingly rare in a world of homogenization promulgated by big corporations. You’ll find the members of Glen’s Neighbor around town doing their jobs, serving the community in their individual capacities, just like you and me. I spent the better part of a day with these guys, and am better for it. I was fortunate to become an eye witness to a portion of what it takes to produce handcrafted, unadulterated, local music, and you can too. Get behind these guys, and others like them, and they’ll make more. The band performing for an audience of one. The original painting in the foreground, by artist Eric Dubnicka, graces the cover of their upcoming release: Your Unknown. Really enjoyed this, Eddy. I’m a fan of Trampled By Turtles and Dead Man Winter, and have heard Whiskey Tango. Excited to check out Glen’s Neighbor. I might send this blog post link to my favorite local radio station, WFPK. They love digging up cool small time musicians and giving them air time. They play “adult album alternative” genre, which I think means all the good stuff you don’t hear on commercial radio. They’ll enjoy your back stories and interview as well. Really cool stuff how you go out of your way to meet your community. Keep it up. Dude, this is great. Thanks so much, Scott. I really appreciate the encouragement.